What makes a legend? Being well known with a touch of intrigue, like that of the Osage orange tree from another time. 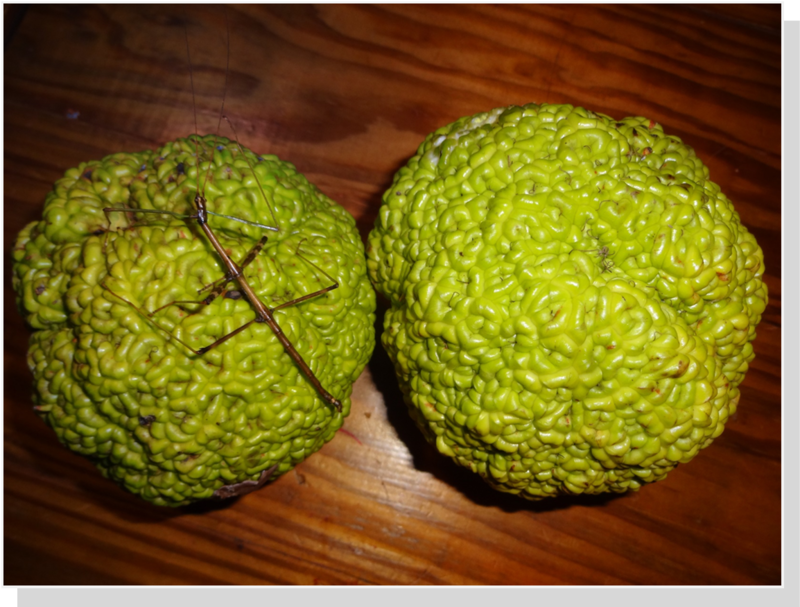 Osages are most noticeable in late summer to early fall when they produce hundreds of otherworldly, grapefruit-sized, bright green, warty, inedible “Osage orange” fruit. It starts as a thorny shrub that can grow to 50 feet. Despite the fruit’s slight citrus scent, it is only distantly related. Its pre-Columbian range was restricted to a small Texas/Oklahoma/Arkansas area; today it thrives in all 48 continental states. And boy, does it love Virginia with the two largest certified world specimens proudly growing for 300 years at River Farm in Alexandria, and Red Hill in Brookneal, VA, the home of the great American colonial firebrand, Patrick Henry. Other Virginia’s “fingerprints” are on the Osage. Our native pioneer, Meriwether Lewis, selected by President Thomas Jefferson to explore the vast territory of the Louisiana Purchase sent Osage slips back to Jefferson in 1804 with a note speaking to its extreme value to the Osage people and other Native Americans with, "so much…esteem the wood of this tree for the purpose of making their bows, that they travel many hundred miles in quest of it." An Osage bow was worth a good horse and blanket! This strong wood was also the native choice for war clubs and tomahawk handles, tannin to make buckskin, and a light orange dye, later was used to color the American forces’ olive drab uniforms of WW I. But what of its legend? 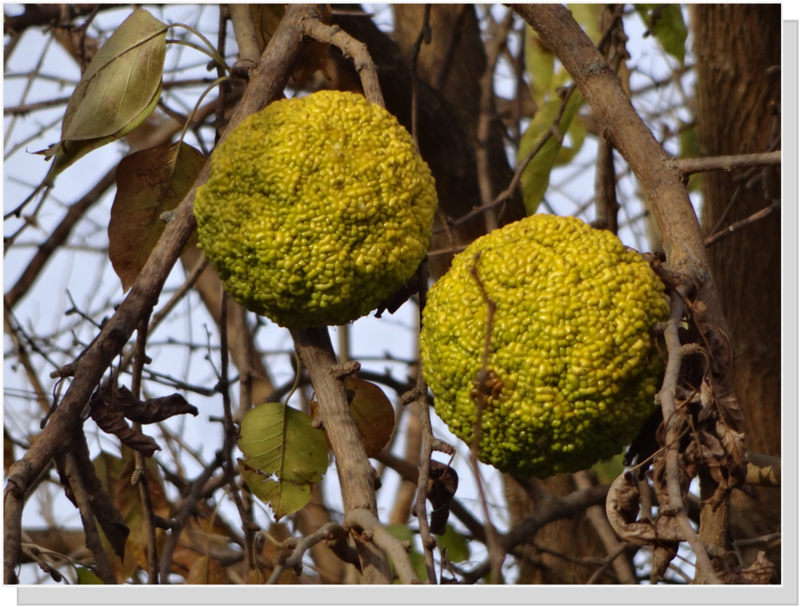 For starters, the Osage is the sole surviving member of the entire tree genus Maclura (M. pomifera), whose many relatives went extinct eons ago. Teasing us with the mystery of how its huge fruits are an evolutionary advantage in dispersing its seeds has spawned a plausible theory. Current wildlife that eat its fruit (squirrels & deer) often destroy the seeds; so it is thought that the original digestion/ seed dispersal was by the large pre-historic mega giant sloths, mammoths, mastodons, and cave bears that I wrote about in ENDEAVOR (see Before Virginia, Jan. 2017). More recently, humans have been the Osage propagator for good reason. Our pioneers knew it was th e best material for wagon hubs and wheel rims, mine support timbers, fence posts, and other decay-resistant products. It has the highest BTU content of any North American wood and burns like coal. It was the rage in the early to mid-1800s for forming impenetrable hedges which grew “horse high, bull strong and pig tight” in four short years! Intertwining limbs (aka plashing) quickened this. Fencing entire farms was possible with no rival until the 1874 invention of barbed wire. But that didn’t stop President Roosevelt's ambitious 1934 "Great Plains Shelterbelt" soil erosion prevention project that by 1942 had planted 30,000 shelterbelts with 220 million Osage trees stretching 18,600 miles. And finally, old timers advise placing a few Osage oranges under the bed or behind the dresser to keep bugs away; scientists say hogwash. So I experimented by placing a very active walking stick insect on an Osage orange which stopped it in its tracks (see photo below). In the end, let’s appreciate the Old Timers, including the grandpa of all trees, the ancient Osage orange.